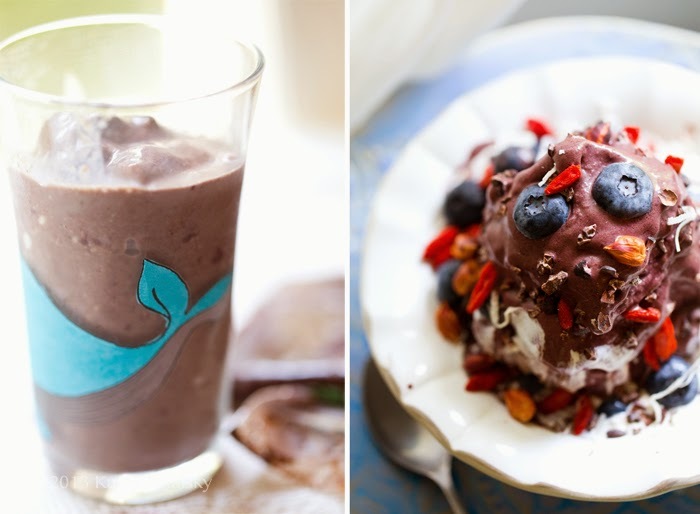 How-to Make Acai Bowls (and Smoothies!) for Summer. If you cannot make it to Brazil, aka Brasil, to taste freshly picked acai berries, here is the next best thing. One of my favorite smoothie flavors: Acai. Rich in antioxidants, fiber, omega fatty acids and more - acai is a delicious Amazonian superfood that is known for its chocolate-y berry flavor and deep purple color. Today I will show you how to build your own acai bowl, or smoothie. Plus a few shopping and acai brand tips. Dive into purple bliss with ah-sigh-eee..
Today, I'm chatting all things acai! Bowls, smoothies, products. Three brands will be reviewed today! But spoiler, I really do love them all. Samzabon, Amazon Planet and Acai Roots. Spoon-dive into this as a healthy breakfast, lunch or pick-me-up! What is an Acai Bowl? An acai bowl is similar to an acai smoothie because it is a set of frozen fruit (and accent) ingredients blended until thick and frosty. 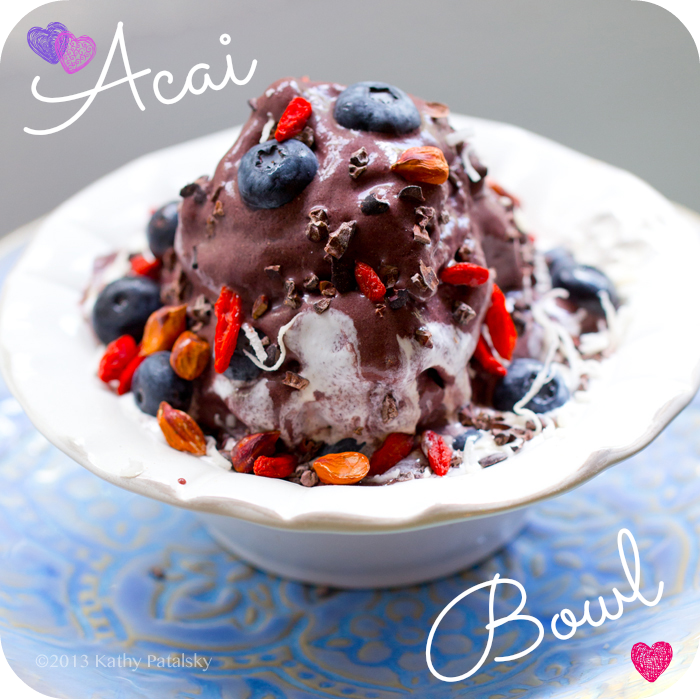 But this acai blend is meant to be served in a bowl and with plenty of fun and delicious toppings on top. 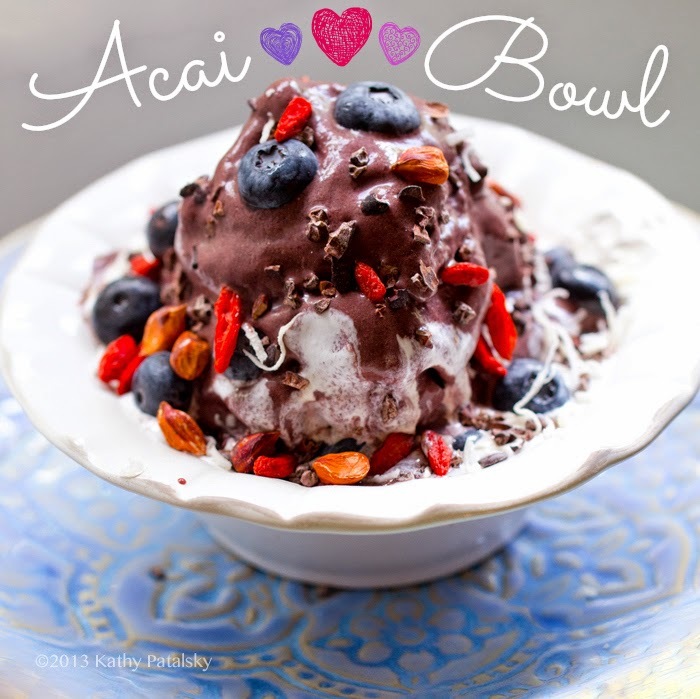 Acai bowl blends are meant to be thick and creamy, eaten with a spoon like ice cream. On top: fresh fruit, granola, nuts and more. You will often find acai bowls in tropical regions where the weather calls for frosty-deliciousness as your breakfast of choice. I have had delicious acai bowls in Hawaii and Miami. Have you had a delicious acai bowl somewhere? - Acai Health Benefits: One 100g serving contains just 60 calories, 3g fiber, 6% RDA iron, 15% RDA vitamin A, 5,800 ORAC units, 4.58mg heart-healthy omega fatty acids, 0g sugar and zero caffeine or gluten. It also contains various minerals, vitamin C and even some calcium. - Buying Acai. Acai comes in a few forms. 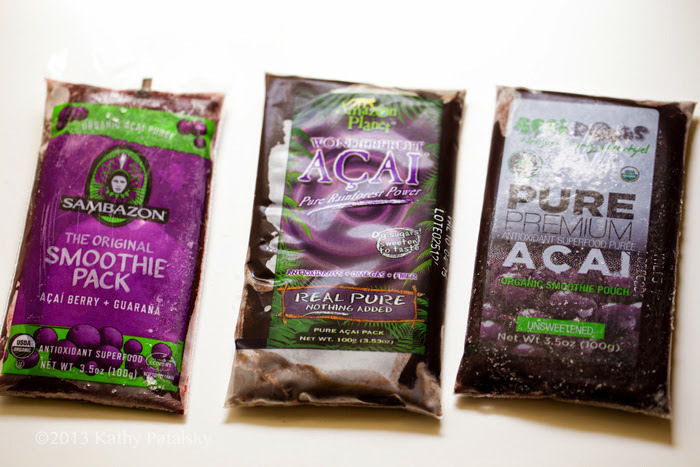 Frozen acai smoothie packs, acai juice and acai powder. 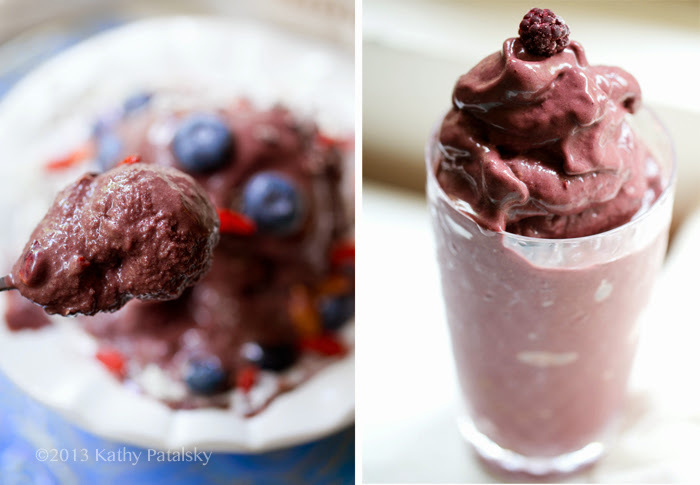 My favorite way to enjoy acai is via the frozen smoothie packs because you can easily blend up frosty smoothies and creamy purple acai bowls. - When choosing acai you can either buy 100% acai or a "blend" product. Below I show three brands and options for frozen smoothie packs. 1. Samzabon: This sweetened acai smoothie pack contains energizing guarana. To taste, the pack is quite sweet, and almost tastes like a popsicle. The acai flavor is a bit less bold due to the added sugar that "waters down" the acai content a bit. The color is a light purple rather than deep purple. Delicious, but a bit less potent than 100% acai packs. Note: The Sambazon brand has a wide variety of delicious acai juices worth trying and testing out as well! I adore the Samzabon brand and buy their products often. They never disappoint. Great company and you can find them in many stores which is even better. They also have an acai powder that is very high quality. Sambazon Products on Amazon. 2. Wonderfruit Acai - Amazon Planet: This 100% wild grown acai is deep purple and super creamy. Delicious option for 100% acai. Amazon Planet Online. - Acai Powder. You can also buy acai powder. OneLuckyDuck.com carries the wonderful Navitas Naturals brand of acai. It is super easy to add to smoothies to boost the flavor and nutritional content. I would advise trying the 100% acai products first to truly taste the pure acai flavor and see that deep color. 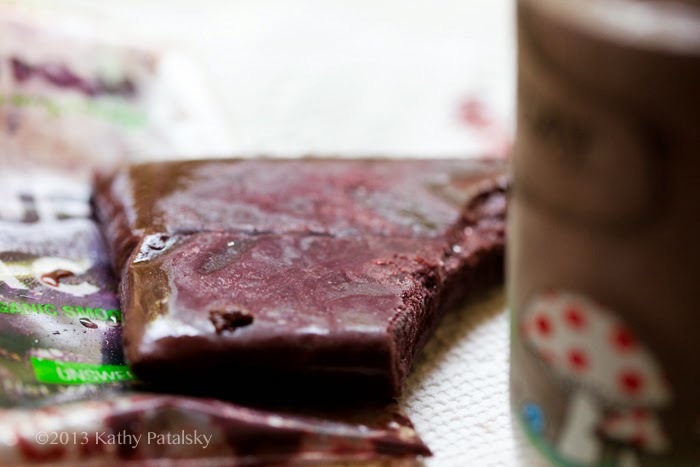 You want your acai to be fresh purple in color - not brownish or too muddy purple. * My acai pack taste testing. The 100% acai, unsweetened brands (Wonderfruit and Acai Roots) had the deepest purple color and most creamy chocolate-y flavor I love. The sweetened Sambazon pack was a bit lighter in acai flavor and color - and a tad sweeter - still delicious. You can see above the lightest purple chunk of frozen acai is the sweetened version. Deeper purple colors being 100% pure acai. 1. Blend. First blend together two acai smoothie packs, a generous splash of liquid and (optionally) some frozen fruit. I like to add one fresh or frozen banana. Vanilla almond or soy milk tastes delicious as the liquid base of an acai bowl. Or you can try coconut milk for a richer, creamier tropical flavor. Blend the ingredients in a high speed blender until creamy, but still very thick and frosty. Too thin? To prevent a too-thin texture, add the liquid in very small amounts, gradually. Just until the blend starts churning. Too thick? If you have trouble with a "too thick" blend, simply keep adding liquid slowly until things smooth out. You could also add in vegan yogurt or even a scoop of silken tofu. Taste test the blend before serving. You can add sweetness (if needed) via agave or maple syrup, fruit like bananas or even using a more sweetened non-dairy milk base. Chocolate spin: Want a super chocolate-y flavor? 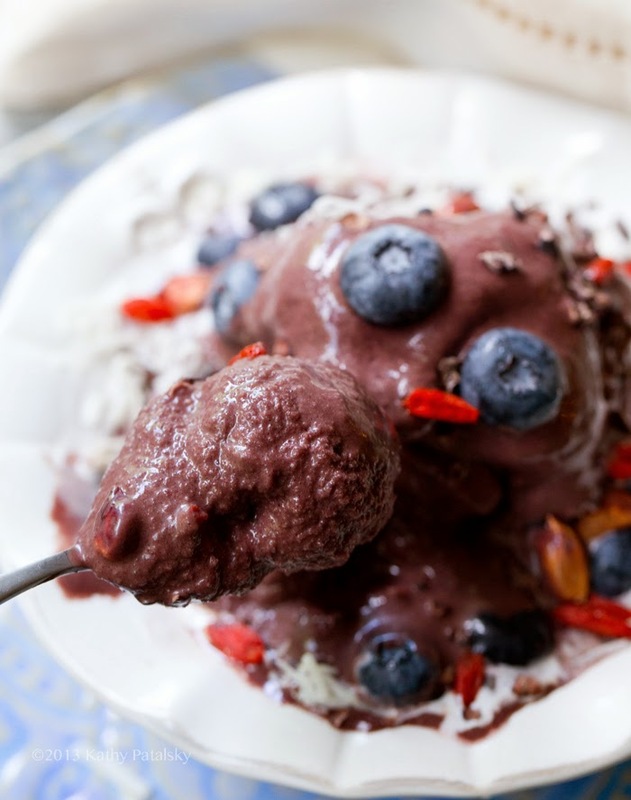 Blend 1-3 tsp cacao powder into your acai blend. Or blend in raw cacao nibs. You could even use a chocolate protein powder if you'd like. 2. Pour. 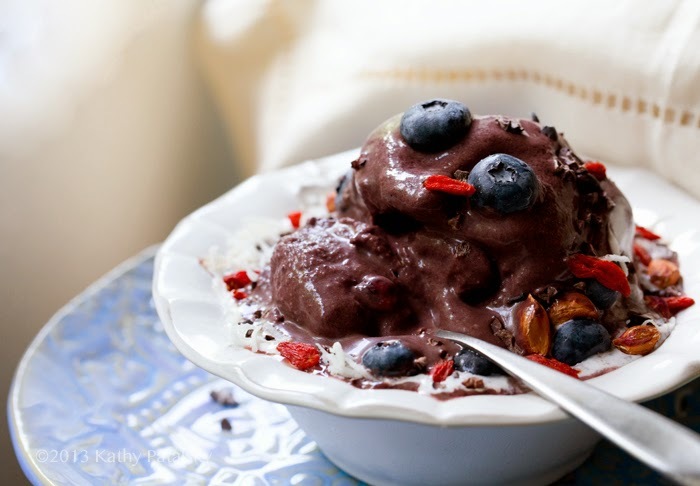 After your acai is thick, frosty and blended, spoon it out into a bowl. Tips: Use a chilled bowl to help keep your acai from melting too quickly! - Or add some frozen fruit to the bottom of the bowl (frozen wild blueberries or frozen organic strawberries perhaps) to prevent quick melting as you eat. 3. Top. Start adding toppings! 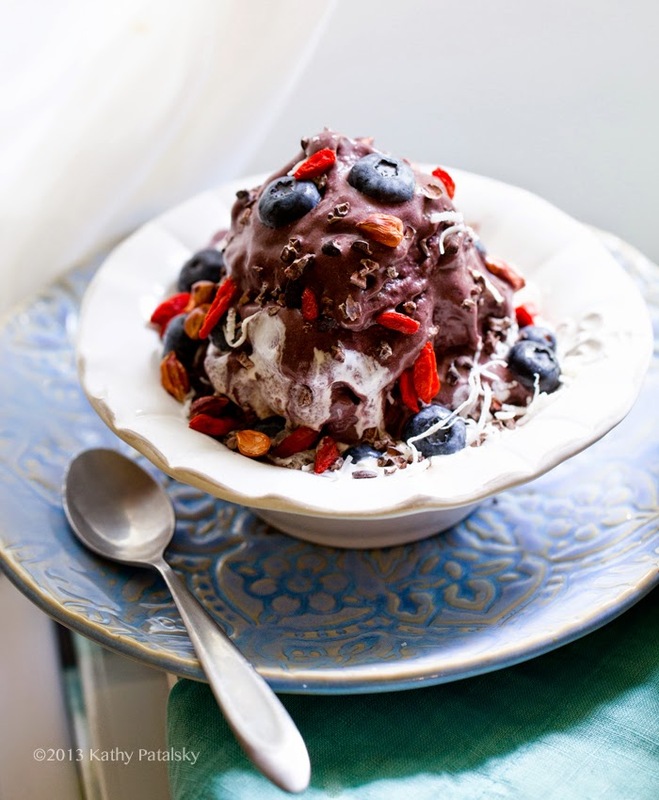 Nuts, cacao nibs, a splash of coconut milk, coconut shreds, fresh berries, sliced fresh banana, chopped nuts, chia seeds, ground flax seeds or even a spoonful of almond butter. There are so many options for toppings. Choose healthy foods you have on hand and fresh fruits that are in season or have a tropical vibe. Serve right away and eat with a spoon! Creamy dreamy purple acai tastes like berries and chocolate. Serve up acai in a breakfast-approved acai bowl. Toppings galore. First blend together the acai smoothie packs, liquid and frozen fruit. Blend the ingredients in a high speed blender until creamy, but still very thick and frosty. Add more non-dairy milk if needed to blend, but add slowly because you want your mixture as thick as possible. 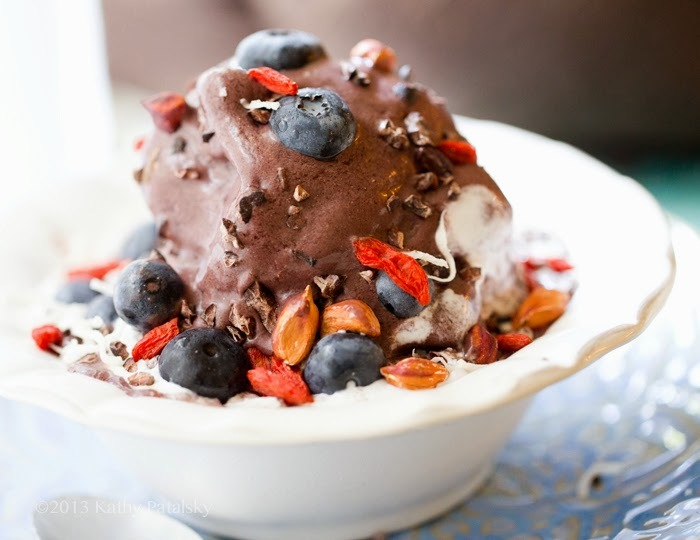 After your acai is thick, frosty and blended, spoon it out into a bowl. Tip: Use a chilled bowl to keep things frosty! Top it! Add the toppings in the recipe or add whatever you'd like! Fruit, nuts and seeds are all delicious acai bowl toppers. Serve with a spoon and enjoy right away. Acai Smoothie! 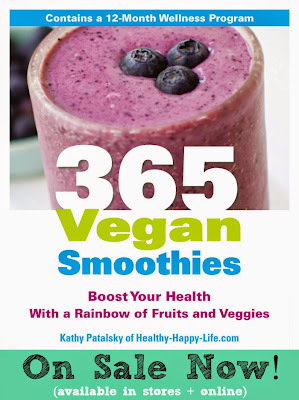 You will find plenty of creative acai smoothies in my book. But here is one super simple recipe that I love. I blend this creamy cool treat smoothie up after long workouts for a refreshing, re-fueling, relaxation-filled smoothie break. 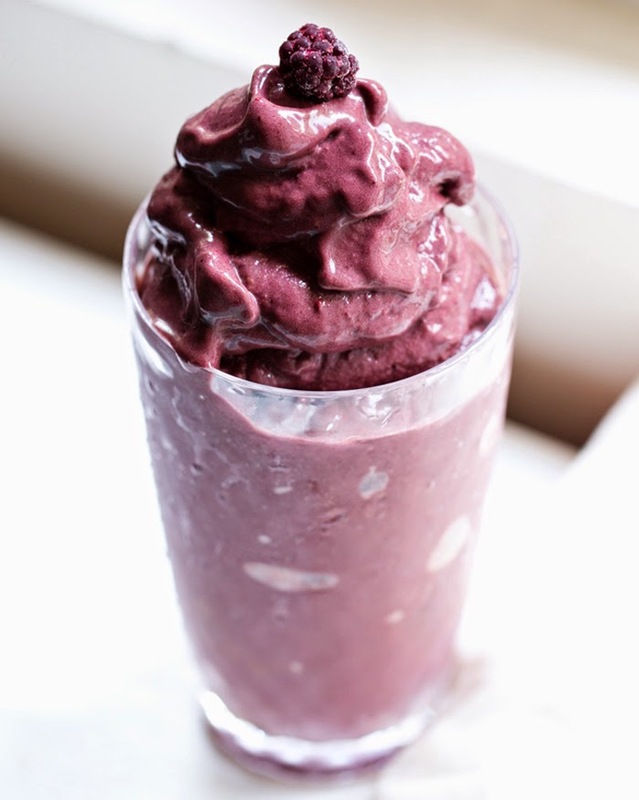 * Add more liquid for a thinner smoothie, less for a thicker shake-like texture. * Add a drizzle of agave syrup or another 1/2 banana for more sweetness. 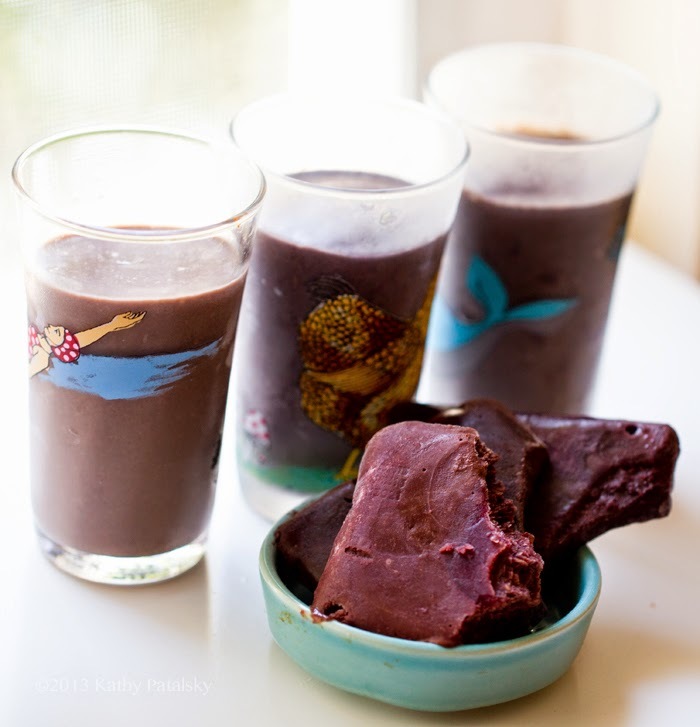 * Add a scoop of protein powder or sub cacao with chocolate protein powder if desired. Bowl or smoothie, both options are delicious + healthy. 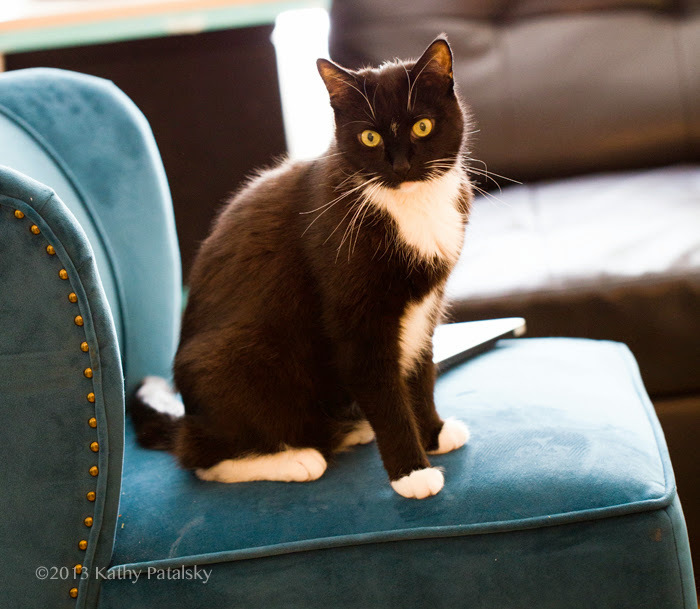 Marilu's radio show focuses on "life through the prism of health." Read my Veggie Girl Power interview featuring Marilu! Inspiration. Marilu's book Total Health Makeover is literally the piece of literature that inspired me the most in my journey towards a plant-based lifestyle. I read it back in high school and was forever changed. Just last night I decided to re-read a few chapters from the book and wow Marilu really nailed some core topics - she was so ahead of her time. If you haven't read THM yet, pick up a copy or download it on your reading device - great book! And her second book Healthy Life Kitchen is great too. In fact, if you can find it, I am even listed in one chapter - the "quote from a college student" is me! Take some time out today or this weekend for wellness and listen to my fun interview with Marilu. I still get so giddy and starstruck each time I chat with Marilu. It is such a wonderful experience meeting your childhood heroes. And Marilu is just the sweetest lady ever. Show info. You can find the show archives online (Aug 2, hour 2) MariluShow.com - my segment aired today Aug 2nd. Tweet (@TheRealMarilu) or email Marilu to let her know you enjoyed the show - I know she would love to hear from you!